Snow has become part of the Christmas picture for many people, whether or not they see any. But if you're dreaming of a white Christmas, the cosmos may have something to offer. Snow or no, we need a tree. About 2600 light years away in the constellation Monoceros (the Unicorn) lies the nebula NGC 2264. It's a large star-forming region which contains two notable star clusters. One is the open cluster called the Christmas Tree Cluster. It's a triangular shape that looks like a stylized fir tree. There are also a number of attractive ornaments for the tree, and I've chosen three interesting ones. 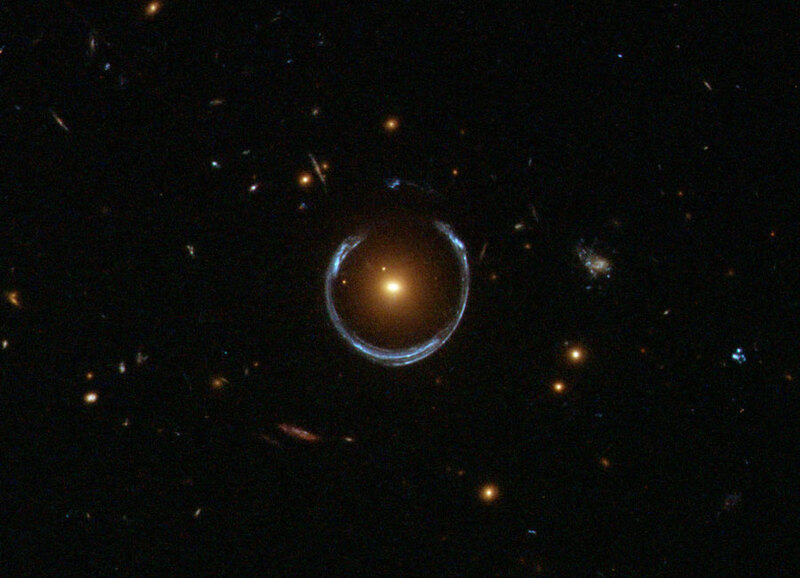 The first one looks like a shiny Christmas bauble, but LRG 3-757 is an Einstein ring. Albert Einstein predicted this effect long before it was ever observed. What we're seeing here is two distant galaxies. The nearer one is the massive luminous red galaxy in the center of the ring. Its strong gravity is bending the light of the more distant blue galaxy. There are multiple images of the blue galaxy, and in this case, they almost form a circle. The effect is known as gravitational lensing. A red spiral turns out to be a planetary nebula created by the dying star R Sculptoris. When a medium-sized star runs out of hydrogen fuel, it expands and starts losing its outer layers of gas. Depending on the local conditions, the resulting nebulae can take many forms. Not only is this one an unusual shape, but it's also only visible as radio emissions. Although we can't see them, high in the Chilean Andes, the Atacama Large Millimeter Array (ALMA) can. I could imagine MWC 922 as a delicate handmade craft object. 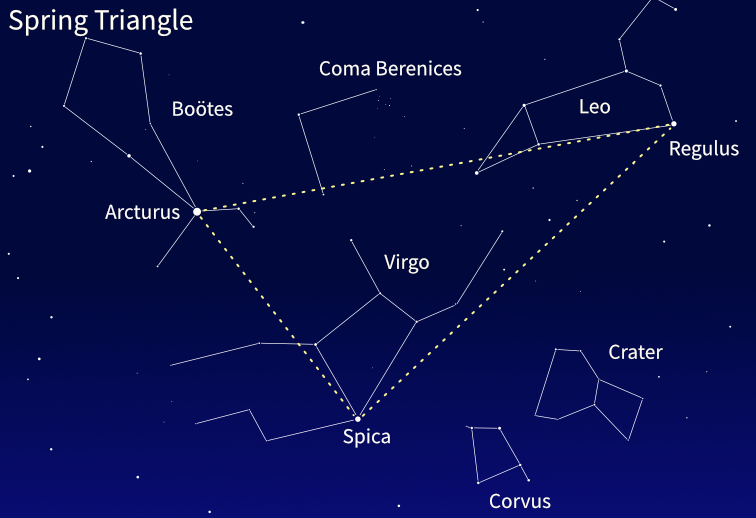 But it's a square nebula far away in the constellation Serpens (the Serpent). 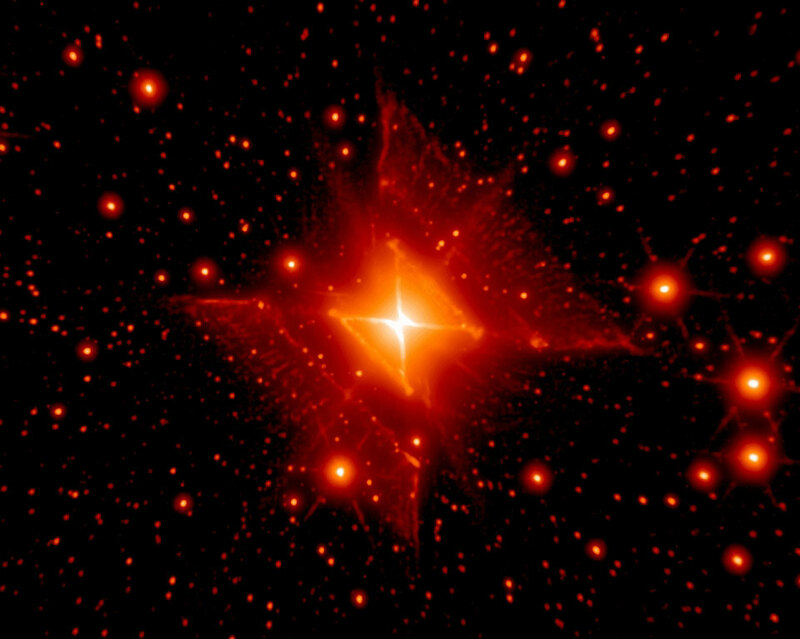 Not surprisingly, it's known as the Red Square Nebula. The hot star system MWC 922 seems to be tucked away in the middle of the square. There are theories about how this astonishing nebula formed, but it's still a mystery. If we go back to NGC 2264 where the Christmas Tree Cluster is, there is another cluster that also contains baby stars. They're in lines that radiate outward like spokes on a wheel – or like a snowflake. So it's often called the Snowflake Cluster. Although you can't make a snowball with one snowflake, we do have NGC 7662 in the constellation Andromeda. Although it looks quite different to the red spiral R Sculptoris, it's also a planetary nebula. Its name, the Blue Snowball Nebula, is an accurate description of what it looks like in a telescope. Getting closer to Earth, there is Vesta's snowman. Vesta is the asteroid that was visited by NASA's Dawn mission in 2011-12. It's cold there, but as Vesta doesn't have any weather, there's no snow. 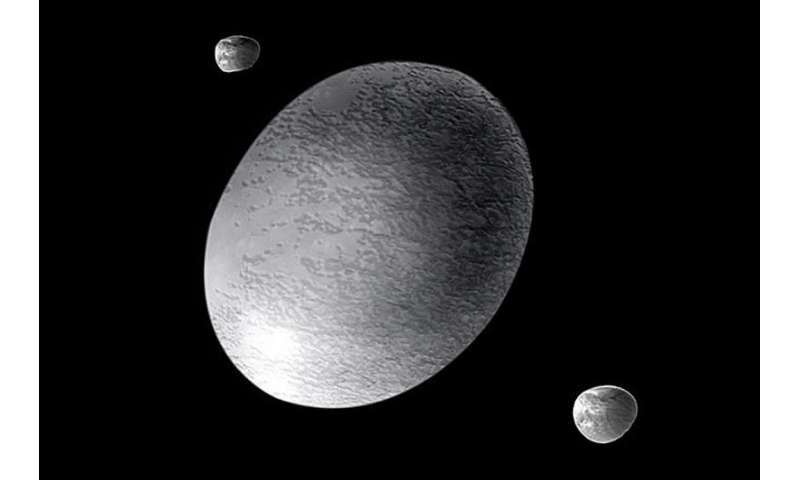 But Dawn saw a row of three round craters in three sizes, arranged just like the traditional representation of a snowman. However for serious extraterrestrial snow, Saturn's moon Enceladus is the place. It has wide areas covered in tiny icy particles – snowlike, but much smaller than earthly snowflakes. It's deep enough to make geographical features rounded and flattened, as a blanket of snow does on Earth. Researchers found one region where it's 100 meters thick (over 300 ft). Despite what's underfoot, you wouldn't get caught in a blizzard there. The annual “snowfall” is less than one millimeter. 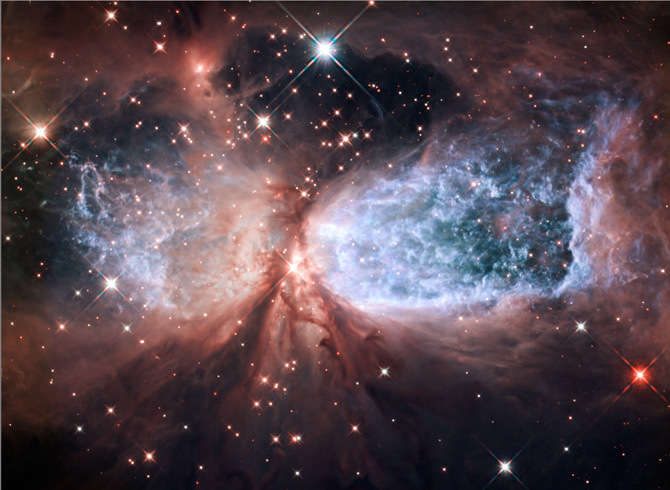 There is also an exquisite Hubble Space Telescope image of the nebula Sharpless 2-106, about 2000 light years away in the constellation Cygnus (the Swan). Because of its uncanny resemblance to the shapes children make lying in the snow, it's known as the Celestial Snow Angel. The nebula is a star-formation region two light years across – that's about 20 trillion kilometers or 12 trillion miles. In its center there are jets of hot gas shooting out from the poles of a hot young star. This is what made the “wings”. 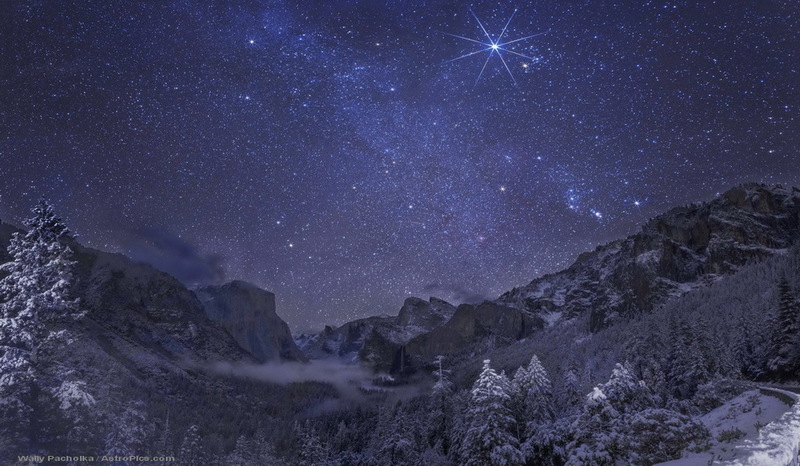 But let's end with the real thing, a splendid picture of a starry winter night over California's Yosemite, photographed by Wally Pacholka. There are “Christmas” trees whose decoration is a dusting of snow, with a marvelous clear dark sky of the kind few people are able to see anymore. And it's filled with lights. 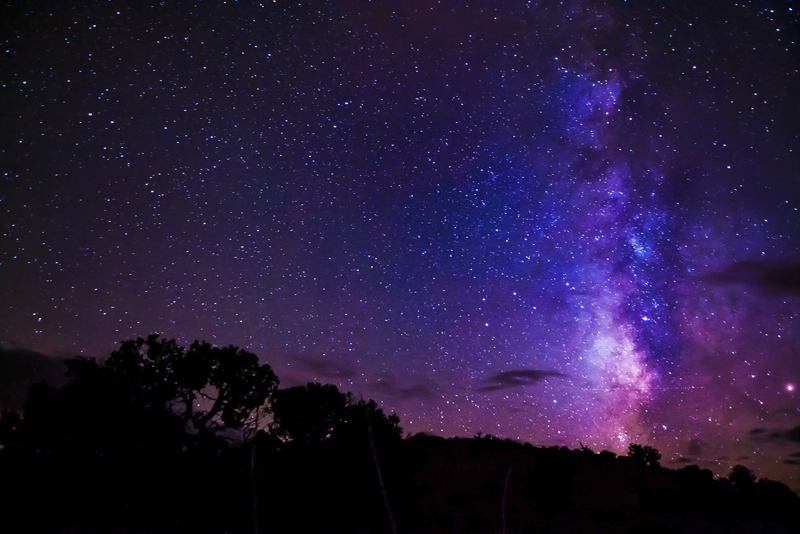 The Milky Way is a creamy backdrop to the constellations Taurus, Orion, Gemini and Auriga. Jupiter is the brightest object in the sky. It's in Taurus and dominates the scene. You have to look closely to see yellowish Aldebaran, the eye of the bull, and the V-shaped Hyades star cluster that marks the bull's face. Such a scene would certainly make a memorable white Christmas.